There is Treasure in the Heartland, and it is right under our feet. The land is gold or you would think so judging by the price it was bringing on Saturday morning at the Ray Myers Farm Auction. It was interesting watching the faces around the room as Dan Sullivan of Sullivans Auctioneers, Carthage, called the price for the last time before Track #1 was sold to the highest bidder, Richard Apt of rural La Harpe, IL. $8100 per acre took the wind out of some people's sails as they watched the price soar on 74 acres of top producing farm land. The next track that came up for bid (Track #2) was also prime farmland, but brought $2400 dollars less per acre at $5700 when the last bid was in. Justin Mohr of LaHarpe found he owned 46.5 acres he hadn't owned earlier that morning. Track #4, with 83 acres (half tillable, the rest wooded for hunting), went to Mike McDowell of Dallas City, for $2700 per acre. 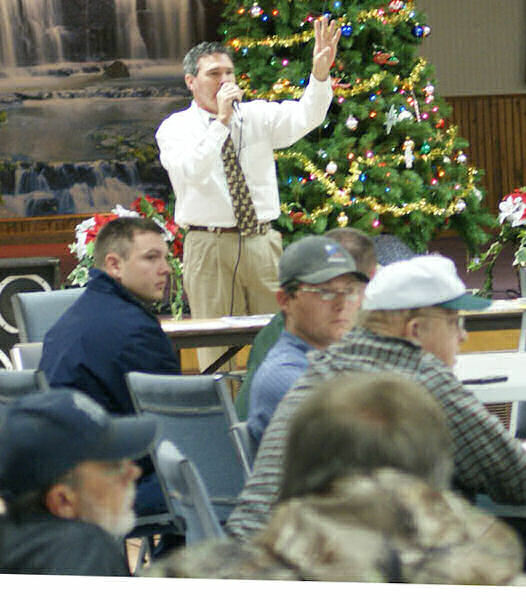 245 acres changed hands Saturday morning going for an average of $5100 with the sale totaling $1,254,550.00. Talking with the man who made the sale Dan Sullivan of Sullivan Auctioneers, Carthage, it was interesting to learn that one of the factors affecting the future of family farm owners is the ever increasing interest on the part of people who turn the soil, in my perception, with their money and mouths, never raising a blister or dirtying their hands. The stock market has lost the confidence of many investors with their attention shifting to the security of land. Own it, rent it, leverage against it, or they can let the share croppers do it. There is a lot of bonus money out there needing investment, and like it or not, it is coming here. How does the title of Corporate Farm Manager sound? The Meyers Farm stayed in local hands, however, the dollars that will go to taxes from everyone's pockets due to increased assessed land values, will shift more of the weight of tax benefits and reinvestment of local profits to city and corporate ledgers. 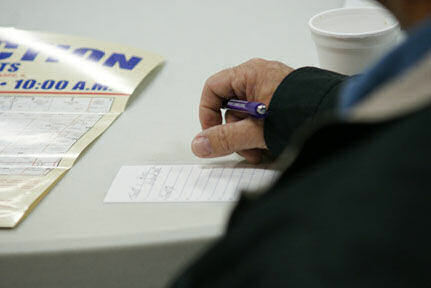 Clayton Stambaugh had farmed 80 acres of the Myers farm since he was 18 years old in 1982 until the sale Saturday. It was a sense of loss that he had to feel having shepherded that land for the last 28 years. But as Clayton said, one door closes, another opens. The same day as the sale, Clayton ran into Dave Pittman, and found a door that will take him in a whole new direction of farming. Clayton and Dave are going into organic specialty crops on 30 acres of Dave's land, which is already certified organic. On my way back from the sale I stopped to visit with Hugh Pence of rural Lomax as he was filling one of his bins with the last of his crop. He had just measured a 17% moisture content and was not finding any mold. At around 200 bushels per acre, the season was looking great. A little more corn and a couple of acres of sorghum and the crop would be secure, and the season done. When I told Hugh about the auction, his response was basically that the price of land was great if you were selling, not so great if you were farming. The cost of doing business is reaching deeper and deeper into working people's pockets forcing them to sell not only the land, but a way of life. The treasure is not always "value" that lasts for a moment, but what a friend calls "worth" that lasts for ever. What is the land really worth when it means a community, and not just someone's property? To me, the Treasure in the Heartland is, for this time- WE KEPT IT LOCAL. FARMERS FIGURE THE COST. THE TOTAL SALE WAS $1,254,550.